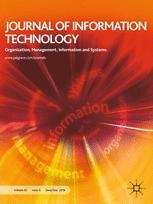 The Journal of Information Technology (JIT) is a top-ranked journal in its field, focused on new research addressing technology and the management of IT - including strategy, change, infrastructure, human resources, sourcing, system development and implementation, communications, technology developments, technology futures, national policies and standards, as well as articles that advance understanding and application of research approaches and methods. The journal publishes work from all disciplinary, theoretical and methodological perspectives. It is designed to be read by researchers, scholars, teachers and advanced students in the fields of Information Systems and Information Science, as well as IT developers, consultants, software vendors, and senior IT executives seeking an update on current experience and future prospects in relation to contemporary information and communications technology.